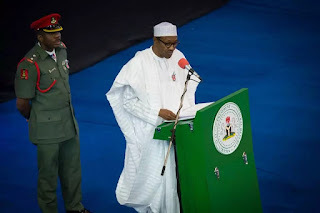 President Muhammadu Buhari on Friday explained why his administration was yet to release names of corrupt former officials of the past administration who voluntarily surrendered their loot. 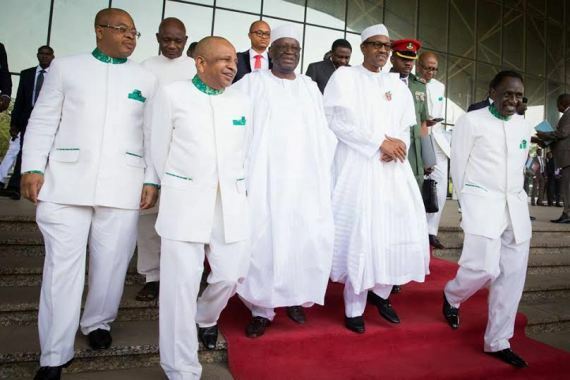 Speaking in Abuja at this year’s edition of the annual Osigwe Anyiam-Osigwe Foundation Lecture, President Buhari said “any disclosure now may jeopardize the possibility of bigger recoveries”. Mr. Buhari said, “As I stated recently, a good number of people who abused their positions are voluntarily returning the illicit funds. I have heard it said that we should disclose the names of the people, and the amount returned. “Yes, in due course, the Central Bank of Nigeria will make information available to the public on the surrendered funds, but I must remark that it is yet early days, and any disclosure now may jeopardize the possibility of bigger recoveries. While our programme of action identified corruption as a very dangerous challenge that must be curtailed if our country could ever generate a future of hope, the issues of collapsing educational system, diversification of our economy, fostering a welfare based agenda for the disadvantaged, infrastructural development, among others, were also very prominent in our campaign focus. When given the opportunity to play a leading role in our national history in 1984, we acknowledged that corruption is not just about the embezzlement of public funds but that the perversion of our consciousness and mindset was the point at stake. This was the basis of our WAR AGAINST INDISCIPLINE (WAI) – Indiscipline in any way and manner is a form of corruption of the human essence. That was why we waged campaigns against indiscipline, and its many manifestations in the 1980’s during my tenure as Head of State of our great Nation. Sadly in this season, we find ourselves in a Nigeria where indiscipline has been taken to an unprecedented level. Th rule of law is grossly perverted, and corruption has been elevated to a way of life at all strata of the society. In striving to reorder our country and put it on the path of recovery, we have thus identified the need to tackle corruption head-on. In this regard, we have taken steps towards recovering a reasonable amount of the money that was looted or misappropriated from public coffers. Investigations are ongoing on public officers who served, or are still serving, and those whose conduct are questionable will be compelled to accept the path of honour and surrender their loots. Quite frankly, the anti-corruption war is not strictly about me as a person, it is about building a country where our children, and the forthcoming generations, can live in peace and prosperity. When you see dilapidated infrastructure round the country, it is often the consequence of corruption. Poor healthcare, collapsed education, lack of public utilities, decayed social services, are all products of corruption, as those entrusted with public resources put them in their private pockets. That must stop, if we want a new Nigeria. And that was why I said at another forum that people need not fear me, but they must fear the consequences of their actions. Corrupt acts will always be punished, and there will be no friend, no foe. We will strive to do what is fair and just at all times, but people who refuse to embrace probity should have every cause to fear. In the process of trying to recover stolen funds now, we are seeking the cooperation of the countries were these loots were taken. Time it was, when such nations may have overlooked our overtures for assistance to fight corruption. However, we now live in an era where corruption is anathema, looked upon as something that should be tackled head-on because the actions of the corrupt can have global impact. It is to be noted that resolving the problem of corruption transcends merely arresting and trying people that have held public office. This is because, to curtail corruption, we have to reorder the mindset of all. Empirical facts have shown that even those who are critics today are most times not better than those they criticize. When they are availed the same or similar opportunities, they act likewise. In other words, those who didn’t have the opportunity criticise and blow whistle but when they get into office; they become victims of the same thing they criticize. Nigeria must grow beyond that point, and be populated by people with conviction, a new breed without greed, radically opposed to corruption.